Here is a question for you : What’s cooler than a shot glass made of ice? The answer my friend is none .. well almost. Now you can ponder over this question with your buddies the next time you throw that party at your pad. Fill Cool Shooter with water or better yet, how about Orange Juice and then once the shot glass has formed, fill er up with Vodka or maybe instead of Orange Juice.. Sprite. Oh the choices are unlimited. 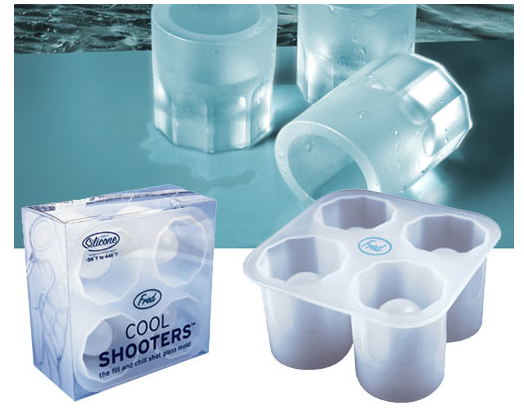 Fill up Cool Shooter with the liquid of your choice, freeze and then pop out four fully formed frozen shot glasses. And you want to know the best part, costs less than a 6 pack of your favorite beer. Yup, this $7 shot glass tray is very useful and perfect for your weekend bash. Posted in Creativity, Shopping/Deals and tagged Images, shopping. Bookmark the permalink.